Here is your chance to find out anything you’ve been curious about the Federal Bureau of Investigation. Come and ask FBI representatives about identity protection, fraud prevention, cyber safety awareness, things you’d like to know about the FBI and how it operates. The program starts at 7 p.m. on Tuesday, January 28, in the Fukaya A Room of the Fremont Main Library. The library is wheelchair accessible. An ASL interpreter will be provided for this program if requested at least seven days in advance. Contact voice 510-745-1401 or TDD 888-663-0660. I’m sure you’ve seen the coverage regarding the 50th anniversary of the assassination of John F. Kennedy, our 35th president of the United States. It must seem like ancient history to many people who weren’t even born then, but to some of us it seems like yesterday. As I watch the programs regarding JFK’s presidency, his life and assassination, I am transported back to the 12 year old I was when it all occurred. I was a seventh grade student at Goodwin Junior High (later renamed Kennedy Junior High) in Redwood City, CA. I was a student aide in the library when an announcement came over the loudspeaker that the president had been mortally wounded in Dallas, Texas. Those of us in the library were confused. Mortally wounded, what did that mean? When we found out that it meant that the president had been killed, we were all stunned. How could this happen to such a vibrant, charismatic man? Many teachers were visibly upset and crying. The school decided to dismiss us early that day and we headed home to our families and our TVs. I clearly remember the next few days as we were glued to the TV watching events unfold. The capture of Lee Harvey Oswald, him being shot by Jack Ruby live on TV, the funeral of JFK, the riderless horse with the boots backwards, the grace of Jacqueline Kennedy, John-John’s salute as the military went by, the terrible sadness of it all. It was the first time in my young life that I had been confronted with such shocking events, and it made an impression on me. Those few days are something I will never forget. It was a time that the nation came together as one to grieve, just like we did after September 11. Of easy wind and downy flake.The woods are lovely, dark, and deep. Fresh Produce at Fremont Main–Wednesdays noon to 4 p.m.
Fresh produce is indeed now available at the Fremont Main parking lot on Wednesdays, from noon to 4 p.m. This started on June 5. One day in the not so distant future, you’ll be visiting the Fremont Main Library and leaving with a bag full of library items and another bag of fresh produce. Fremont Main is entering into a partnership with Dig Deep Farms and Produce, a social enterprise and a project of the Alameda County Deputy Sheriffs’ Activities League. The Dig Deep Farms website describes a weekly delivery service of fresh produce; the partnership with Fremont Main Library is a pilot project that will bring Dig Deep produce stands once a week to consumers for the first time. That those first produce stands will be on library grounds certainly says something of Fremont Main’s role in our community. So how about that? With one trip to the library, you will be taking home food for the mind as well as food for the body. It certainly is a good deal to look forward to. You’ll know when it’s here. 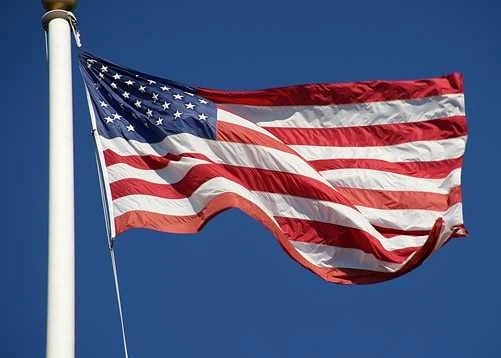 The flag should be flown during daylight and when it is not raining. The flag should never be flown upside down. The flag should not be used for advertising. When lowered to be put away, no part of the flag should touch the ground, it should be received by waiting hands and arms, and folded in a ceremoniously way. The flag should be cleaned and mended. You can take a look here to see more rules for displaying the American Flag. If you would like to make a flag craft to celebrate flag day today check out enchantedlearning.com for fun projects to make at home. Unlikely Allies by Joel Richard Paul is everything they didn’t teach you in school about the days leading up to the American Revolution. The year is 1776. Silas Deane, a Connecticut merchant who can’t speak a word of French, is in Versailles trying to convince Louis XVI to sell arms and ammunition to the Americans. Chosen by Benjamin Franklin to be the representative of the Continental Congress, Deane arrives in France months before Franklin and must survive by his wits alone, as the place is crawling with spies and incognito French police officers– and they’ve all got a stake in the political shenanigans that are about to take place. What help can the insolvent but determined Pierre-Augustin Caron de Beumarchais, a French playwright and one-time aristocrat offer Deane? And in any case, can Deane trust him? These are just two of the colorful characters in Paul’s account of the long struggle to persuade Louis XVI to back the new country with much-needed supplies and then to actually get them delivered to Washington’s desperate army. It is a tale of espionage and counter-espionage, of cat-and-mouse diplomacy among men of all ranks who double-crossed each other as frequently as the wind changed. It is also the story of one of history’s most enigmatic characters, the notorious Chevalier d’Eon, a cross-dressing French soldier turned diplomat turned blackmailer, without whom the outcome of the Revolution might have been very different.